Electroplating is a common metal finishing process with several industrial applications, ranging from the purely cosmetic to the application of protective coatings. The process, which uses electric current to drive ions towards receptive metal surfaces, is sensitive to multiple key parameters and careful control is crucial to achieving desired plating effects. Several components, including the concentration of ions in the plating bath, the bath temperature, and the electric current density, can be adjusted to affect the final outcome. The process of electroplating has produced many rules of thumb for proper operation but by replacing conventional rules with pH measurement, quantitative feedback can be used to guide electroplating process control for improved product consistency and efficient waste treatment. Preparation of the electroplating solution is critical to the success of the electroplating process. Electroplating chemical preparation consists of dissolving metal salts into a solvent. The resulting electroplating solution must have a high enough concentration of metal ions to promote plating of a part. Plating occurs at the cathode when hydrogen ions (H+) are reduced to hydrogen gas (H2). As these hydrogen ions are lost from the cathode film, plating occurs when metal ions (such as nickel ions) “step in” to replace the hydrogen ions. Sometimes, an electroplating process produces a dark grey or black, flaky build up at the cathode. This commonly referred to as “burning.” Burning in an electroplating process can occur if the electroplating solution is not properly prepared. If the metal ion concentration is too low, then the electric current will hydrolyze water to produce hydrogen ions (H+) and hydroxide ions (OH-). The production of hydroxide ions can lead to the formation of metal hydroxides such as Nickel II Hydroxide Ni(OH)2, which deposit on the surface of a part instead of metal ions. Measuring pH allows operators to detect this effect, because the production of hydroxide ions will lead to an increase in the pH. Additionally, some electroplating processes may benefit from the use of a buffer, such as boric acid. The buffer ensures that pH near the cathode remains stable at the optimum level for metal plating. The optimum pH for an electroplating process depends on the metal to be plated as well as the solvent and any other additives. Proper pH can be anywhere from acidic to neutral to alkaline, depending on the solubility of the metal in the solvent. Nickel and copper plating in acid baths are optimized around 3.8 to 4.2 and difficulties occur at pH above 5. Alkaline baths can be used for faster plating of materials such as gold, zinc, and chrome, and will have an optimum pH of 9.0 to 13.0. Monitoring pH during initial make-up and over the course of the electroplating process can help to catch procedural errors. Even when a process is properly configured before starting, pH can be used to monitor the consumption of ions over time and inform when and how to replenish the electroplating bath. The effective current is also a function of the concentration, since the bath acts as a resistance between the two electrodes, so pH monitoring can be used to ensure that a constant current is supplied, thus producing a consistent deposition layer. Electroplating wastewater must be treated for toxic chemical removal before discharge to municipal sewers. Just as pH needs to be controlled in the electroplating process to keep metal ions in solution, pH can also be used in wastewater treatment to precipitate ions for removal via sedimentation and filtration. Hexavalent chromium, which is highly toxic to humans, can be removed by a 2-step process. Hexavalent chromium is first reduced to trivalent chromium by reducing the pH and increasing the oxidation-reduction potential. Then, the pH is raised to above 8.5 to allow chromium to precipitate as chromium hydroxide. Zinc and copper can also be removed by high pH adjustment to precipitate the metals as hydroxide complexes. However, when cyanide baths are used as the solvent, the metals are complexed with cyanide and will not be removed by pH adjustment. Zinc, copper, gold, and nickel are all commonly plated using cyanide baths. To remove the cyanide, the oxidation-reduction potential is increased to reduce the cyanide to cyanate, thus releasing the metal ions and allowing them to complex with hydroxides and form precipitates. 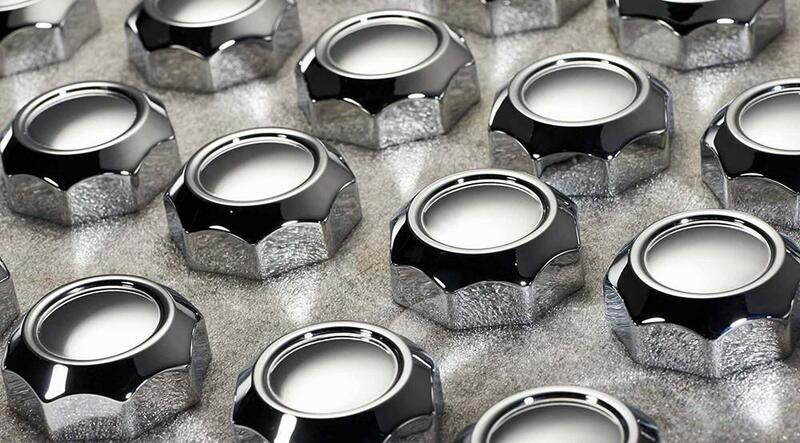 Metal finishing involves several industrial water and wastewater treatment processes that can be achieved using online sensors and instrumentation. However, due to the high concentration of metal ions in electroplating baths and wastewater, combination pH electrodes may require frequent replacements. Combination pH electrodes rely on a silver and silver chloride reference solution within the probe that can become contaminated by heavy metal ions such as chrome, lead, and cyanide. New probe designs protect the reference solution by either preventing contact with the sensor with junctions or lengthening the path that ions need to travel within the probe. Some probes even use alternative reference solutions. Regular cleaning to remove build-up and deposits will maximize the life of the pH sensor. Sensorex S8000 pH sensors feature a double junction design and an extended pathway to the reference. Together with a modular design that greatly reduces maintenance time, the S8000 is an ideal choice for the metal finishing industry. If reference poisoning is a persistent issue in your electroplating application, consider trying a differential pH probe. These probes use a buffered reference solution that can resist pH change even when some poisoning occurs. This extends the working lifetime of a differential sensor when compared to a combination pH sensor.